Create a calming oasis with this meditative box filled with fine sand that shifts with your inspiration. Take a moment for yourself as you give your creativity an oasis for private reflections, hidden thoughts, and creative yearnings. Inspired by the transitory and forgiving nature of sand, artist Jayne Riew designed this meditation box for artists, writers, and other creative professionals with lots of mental traffic. Fine grains of sand shift and swirl with your imagination and engage the mind in a way that a blank canvas or paper cannot. A soft velvet layer lines the base, creating a soothing sensation as the stylus makes its mark. The compact size of a tablet, this meditation box can be used as an innovative escape at your desk or bedside table to encourage meditative calm. Made in High Ridge, Missouri. 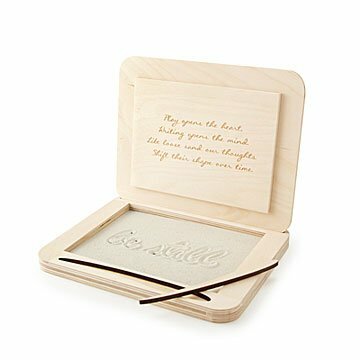 The Custom Meditation Box allows for customization of the inside lid of the box with your own personalized message, with a maximum of 6 lines and 40 characters per line. Visit the blog to learn more about Jayne's inspiration for the Meditation Box. For a non-personalized version of the Custom Meditation Box, check out the Meditation Box. The Meditation Box was designed by Jayne Riew and produced by Artificer Wood Works. Jayne Riew makes books and boxes designed to promote introspection or documentation, or to help identify the unspoken or unexpressed. When it comes to toxic emotions in particular, acknowledging unwanted thoughts is hard enough. Having a personal space with a lid or cover such as the Meditation Box can invite the practice of expressing such thoughts and emotions. Since their founding in 2011, Artificer Wood Works has been a company of creative thinkers and makers, blending an innovative spirit with the nostalgia of artisanal craftsmanship to handcraft unique and clever products. Their journey began when the search for a unique wedding gift inspired them to create Wine for a Wedding—a unique wine box designed to celebrate future anniversaries. Since then, the size and capabilities of their wood shop has grown significantly, allowing them to explore new creations. Originally designed by Jayne Riew for her friend, author Susan Cain, who had trouble "unplugging" at the end of the day, the Custom Meditation Box embraces the impermanence of thoughts and words, defining a desktop space to let them flow through meditative, creative writing using simple materials that can be utilized again and again. With a playful nod to Susan's omnipresent computer, the form of the box and its lid is laptop-like. Inside, the transitory and forgiving nature of writing lines in sand encourages free expression in a way that blank paper cannot. The lid offers an inspiring quotation and protects the workspace, while the stylus fits into the box for a convenient, self-contained design. "To blend an innovative spirit with the nostalgia of artisan craftsmanship; to handcraft unique and clever products." Artificer Wood Works pays employees a starting wage of $14/hr., which exceeds Jefferson County's living wage. All full-time employees receive 2 weeks vacation and 1 week personal/sick leave per year, as well as having a flexible working schedule. PTO varies by employee. Some are salaried and receive 5 personal days and 10 vacation days that start immediately. Some employees desire and require a more flexible schedule and have chosen to be paid hourly, which does not include PTO. Their wood waste is reduced and recycled in multiple ways: reducing waste by utilizing scraps in unique and creative ways; donating wood shavings to a nearby wildlife rehabilitation clinic to be used as animal bedding; donating other wood waste to Hoppiness farms to be recycled into BioChar for soil conditioning—a carbon negative process. They also recycle their general waste and take any empty hazardous containers (from paint or stain) to their county's environmental services location where it is disposed of properly. Along with their wood and some box donations for charity auctions, Artificer Wood Works also donates the funds necessary to plant a tree for every item they sell. Since their founding in 2011, they've been donating annually to the nonprofit organization Trees for the Future, helping to plant thousands of trees. Trees for the Future is dedicated to planting trees with rural communities in the developing world, enabling them to restore their environment, grow more food, and build a sustainable future. Birch plywood, white sugar silica sand (natural source materials), and velvet. The Custom Meditation Box is packed in a partially recycled and fully recyclable/compostable box and partially recycled and fully recyclable/compostable kraft paper. There's one place—and only one place—where you'll find the Custom Meditation Box: UncommonGoods. I need more sand to make the gift 5 star perfect. Not enough sand for the product. Can you send me more sand to make the gift perfect. And a 5 star rating. I customized it on the webpage and was nervous about how it would turn out... needless to say, it was beautiful and looked just like the picture!! It was the perfect mother's day gift. Super happy with everything. I had a quote engraved on the inner lid for my Daughter-in-law and gave it to her for her birthday she loved it so much she cried and said it was the perfect gift for her . Everyone at her birthday party enjoyed it as well!! This was a unique gift item. The recipient loved it, and it totally fit her style! Overall, I'm happy with this purchase. Its overpriced for sure but for items you can't get elsewhere this is to be expected. The personal engraving is what makes it for me and I look forward to giving it to the recipient at Christmas. I wish the box was given some sort of coating as its a bit sparse but I guess that is more Zen. I was very surprised by the amount of sand included. It didn't seem even close to enough but I called customer service and they are happily sending me more. I like the customization aspect, i wish the top could have been customized as well. The etching inside was a tad light, would have liked it a slightly deeper. Only thing I would really change is I wish it came in a gift box. I will be wrapping it in paper as I don't have a box that nicely fits this size. Personalized the quote for a birthday gift for a friend who is a writer. She loves it - had never seen anything like it. Makes a good anniversary gift! I customized the text to make it an anniversary present for my friends. They are still in love with each other and are the kind of couple who leave little notes around the house. So I thought that they could leave the lid propped open whenever they wanted the other person to find a message. Just got a TY note from them saying they love it and are moving it around from room to room in their house.